Need a crash course in proper tree watering? Shown below are some key facts you should know when caring for a new tree. Why is deep watering my new tree so important? Newly planted / transplanted trees, with their greatly reduced root systems and the shock from being removed, are in great need of frequently applied deep irrigation. Deep watering keeps moisture concentrations far below the surface, reducing transplant shock, and attracting roots downward deep into the soil. How deep is "deep enough"? Deep watering to a depth of at least 12 inches or more is recommended. Most of the root system of a tree is located within the top 2 to 4 feet of soil. 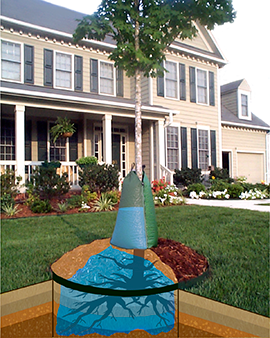 With new trees, it is also recommended that water be applied directly over the root ball / root mass. How can I efficiently achieve deep water saturation? Experts suggest that the best way to efficiently ensure deep water penetration is to slowly and evenly apply a high volume of water in a single application. Treegator® Bags slowly and evenly applies a high volume of water over an extended time period, allowing for deep water saturation with every application. How much water does a new tree typically require? While there is no standard watering amount that is suitable for all new trees, there are general watering guidelines that can be followed. One commonly used formula suggests 10 gallons of water per week for every 1 inch of tree caliper. For example: A single 2 inch caliper (trunk diameter) tree would require approximately 20 gallons of water per week. 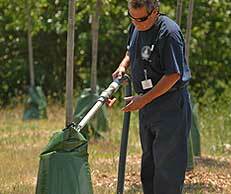 A Treegator® bag will apply 15 to 50 gallons of water in a single application (depending on model and bag setup), equating to a fill schedule of 1 to 2 times per week for many new tree / shrub planting applications. Can't I just apply water frequently with a sprinkler? Watering a tree lightly, even on a regular basis, is insufficient. Most of the water applied will be lost due to run-off and/or evaporation. And most importantly, light applications of water will force roots to the surface, leading to shallow rooting and poor root anchorage. Treegator® Slow Release Watering Bags slowly and evenly provide a high volume of water over an extended time period with just one application / fill. Why do newly planted trees need so much water? Newly planted trees lose much of their root system during digging. Because of this, they are much less effective at taking up water, and thus require much more water than established trees. A Treegator® Slow Release Watering Bag can apply up to 50 gallons of water in a single application / fill (using a Treegator® Original Double Bag Setup). How long can it take for a new tree to get established? 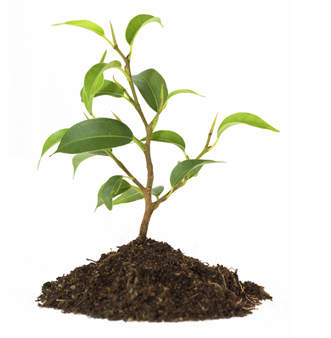 It can take several years for a transplanted tree to re-establish its root system. On average, proper establishment of a new tree can require 1 year for every 1 inch of trunk caliper (diameter). So, for a newly planted 3" caliper (diameter) tree, it can take up to 3 years for it to become fully established. Why does it take so long for a new tree to beceome established? Transplanted trees lose much of their roots during digging, and thus experience an adjustment period called transplant shock. This also makes new trees more susceptible to weather variations - particularly drought. What are the signs / symptoms of transplant shock? Symptoms can vary depending on tree species, weather and soil conditions - However, signs typically include; shortened or poor annual growth, wilted leaves, increased seed production, reduced flowering, early fall color, and early leaf drop. What can be done to curb the effects of transplant shock? Proper and regular watering is essential. 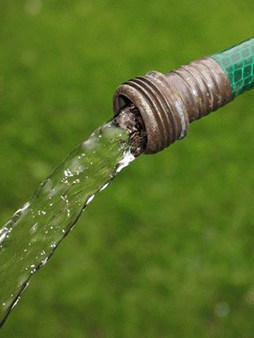 Supplemental watering (in addition to rainfall) is recommended for at least the first 2 years. Treegator® Slow Release Watering Bags are the best way to make sure your trees receive the deep, high-volume irrigation they need. While there is no standard watering amount that is suitable for all new trees, there are general watering guidelines that can be followed. One commonly used formula suggests 10 gallons of water per week for every 1 inch of tree caliper. Watering a tree lightly, even on a regular basis, is insufficient. Most of the water applied will be lost due to run-off and/or evaporation. And most importantly, light applications of water will force roots to the surface, leading to shallow rooting and poor root anchorage. Newly planted trees lose much of their root system during digging. Because of this, they are much less effective at taking up water, and thus require much more water than established trees.